The Cherished Teddies Collection began in 1992 and was for many years one the most popular and top performing collectibles. Early teddies remain sought after, but the prices of most figurines on the secondary market have come down after initial highs. The collection also included ornaments and decorative accessories. Pictured left: Tisha – Cherished Teddies Collectors Club Symbol of Membearship 2012. 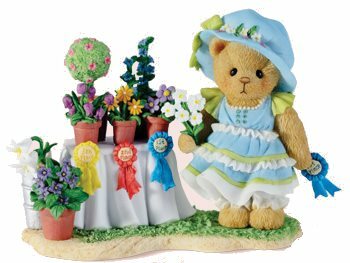 The 2012 Club Figurine was inspired by Priscilla’s love of flowers and the tremendous joy she has experienced from gardening for many years. “Tisha” is getting ready to take her basket of flowers to the flower festi val, to enter them in the county competition. She is hoping that she will win the blue ribbon this year! Originally all the Cherished Teddies began life as pictures by artist Priscilla Hillman (whose other collections include Calico Kittens, Priscilla’s Mouse Tales, and My Blushing Bunnies). Today her son Glenn, works alongside her and together they come up with all the Cherished Teddies ideas that become models. Each Cherished Teddies Figurine carries a Certificate of Adoption which can be completed and forwarded to the Cherished Teddies Adoption Centre for registration. 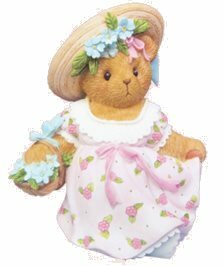 All the Cherished Teddies live in Cherished Teddies Town, and many of the figurines relate to specific collections. The range includes ornaments, limited editions, popular seasonal Cherished Teddies and exclusives. The Cherished Teddies Club was launched in 1994 and continues to be the most popular collectors clubs and enables membears to receive joining gifts, the opportunity to buy exclusive Cherished Teddies and to keep up with all the latest bear happenings through the club newsletter, The Town Tatler. Sadly, the UK and European arm of the club closed at the end of 2012 along with the UK & European distribution of Cherished Teddies. From 2013 the club is being managed totally by ENESCO USA. Only Charter members from the UK, Europe and Canada have been permitted to retain named membership. Pictured left: Blythe one of three members only figurines for 2012. The others are Bette and Sally. The Reward Figurine for 2012 is Helena. For 2012 the club has a flower gardening them. As well as the figurines, members also receive a box complete with plant sticks and gardening gloves, and a lapel pin. NOTICE – This site is not affiliated with Cherished TeddiesTM or ENESCO TM. The purpose of these pages is to provide information to collectors of Cherished Teddies.